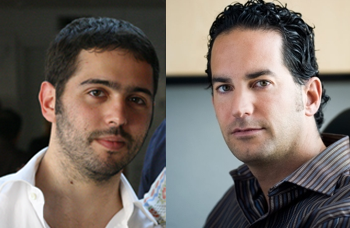 In April, we reported that Diego Berdakin and MySpace co-founder Josh Berman, the two heads of News Corp’s incubator Slightshot Labs, were leaving the company. They haven’t wasted any time in launching their next project: today, less than two months later, Berman and Berdakin are announcing that they’ve raised $5 million from New Enterprise Associates and Anthem Venture Partners for a new startup called BeachMint, Inc.
At this point details on the startup are still a little sparse, but Berman and Berdakin were willing to talk broadly about what BeachMint will be doing. The company will be entering the social commerce arena, with plans to launch a suite of sites catering to individual verticals. The goal, Berman says, is to drive people to curated, authentic choices with recommendations from celebrities and other ‘influencers’— think Kim Kardashian’s association with ShoeDazzle, but for numerous different verticals. Berman also noted that these recommendations will be authentic and may come from people who have less high profiles (it sounds like the sites may tap into your social graph). The company will be launching its first vertical before this holiday season, with plans to announce it by the end of summer. Each new vertical will have its own brand, but all of the site names will likely incorporate the ‘Mint’ branding (e.g. BookMint or WineMint, though Berdakin was quick to point out that neither of these would be part of the company’s initial launch). Berdakin and Berman are well aware of the established competitors like Gilt Groupe, but believe that there’s still a huge opportunity in online retail spending, explaining that only 6% of retail spending happens online. The Santa Monica-based company currently has seven engineers building out its product. We’ll have more on BeachMint this summer.